Donald Trump has been accused of copying and pasting a tweet which sent support for the wrong shooting in America. On Tuesday, a gunman opened fire at various places in the region of Rancho Tehama including an elementary school, killing four people and injuring at least one child. 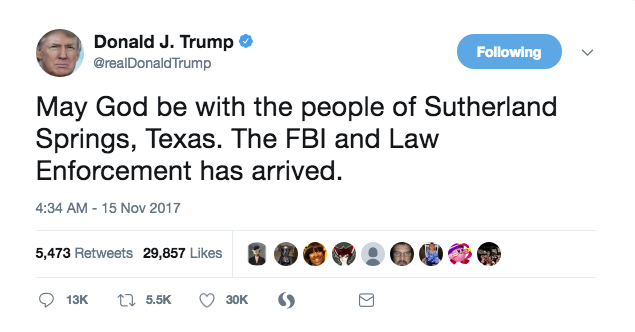 The US President mentioned Sutherland Springs in the post, where 25 people were killed in a shooting in Texas two weeks ago. Many Twitter users were quick to point out this mistake, blasting the President over the tweet which, as of yet, remains on his page. The incident in California is the latest high-profile shooting to impact America in the wake of the Sutherland Springs and Las Vegas massacres.